Grand Excursion Preview  Trempealeau to Fountain City, Wis.
Trempealeau to Fountain City, Wis. Most people believe the Mississippi River flows north to south, and generally, this is true. But from Fountain City to Trempealeau, Wis., it flows more east than south. If you stand on the Minnesota bank of the river on this stretch, you can watch the sun set on the upstream side and the full moon rise on the downstream side. Trempealeau Mountain, sacred to the Ho Chunk (Winnebago), is the only island mountain in the upper river and has always been a landmark for river travelers, probably going back at least a couple of thousand years. The mountain and the area once contained dozens of Indian mounds and many petroglyphs. Most of the mounds were destroyed, but many remain. 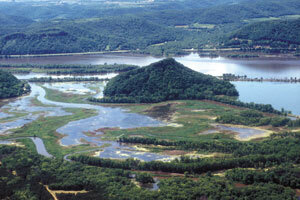 Trempealeau Mountain is now part of Perrot State Park. The park is just north (oops! that would be west) of Lock and Dam 6 and the village of Trempealeau (pop. 1,319), where the first Grand Excursion made a brief stop. Now the Great River State Trail brings bicyclists to town. The park brings hikers and campers. The backwater lakes just downriver bring anglers and paddlers. Just upstream from Perrot and separated from the river by a long, straight railroad dike, the Trempealeau National Wildlife and Fish Refuge attracts an amazing variety of birds, including pelicans, harrier hawks and abundant waterfowl. Tiny Homer, Minn., was home to one of the earliest settlers on the west (south) side of the river. Willard Bunnell built a beautiful Steamboat Gothic house here in the early 1850s that visitors can tour in the summer. 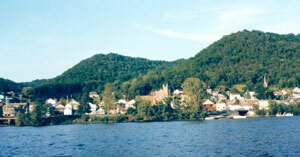 The biggest city on this stretch of the river is Winona (pop. 27,069), known internationally for its especially intelligent and good-looking citizens. The main part of the city rests on a sand bar, and was separated from the nearby bluffs by a swamp, now the dredged and charming Lake Winona. The Dakota Indians kept a summer village in Winona, raising corn and fishing there until settlers built sawmills along the banks of the river, where rafts of white pine logs from the Chippewa River pineries in Wisconsin were ripped into lumber from about 1875 to 1915. Today Winona is headquarters for Wenonah Canoe, a major manufacturer of canoes and kayaks; headquarters for the Upper Mississippi River National Wildlife and Fish Refuge; and headquarters for Big River Magazine. To see local river culture, visit the boathouse community on Latsch Island, or visit with fishermen at the Lock and Dam 5A spillway at Prairie Island Park. The river is wild and dotted with islands between Winona and Fountain City, Wis. (pop. 983). Named for the many springs in the surrounding hillsides, Fountain City was originally called Holmes Landing. The citys streets are terraced into the bluff, giving most of the houses a view of the river and a southwestern exposure. The Army Corps of Engineers Boat Yard and the dredge William A. Thompson make Fountain City Bay their home. Merrick State Park, just three miles above Fountain City, rents canoes, offers campsites on the river and good access to the Whitman Bottoms, a maze of backwater channels. In fact, this 33-mile stretch of river between Dakota, Minn., and Buffalo City, Wis., includes four state parks: Great River Bluffs and John Latsch in Minnesota; and Perrot and Merrick in Wisconsin. The bluffs in Latsch  named Hope, Faith and Charity by river pilots  provide an enticing look into the Whitman Bottoms. The park is named after a former Winona philanthropist who donated thousands of acres of land along the river to parks and refuges. Many consider the stretch of Minnesota Highway 61 between Dresbach and Winona one of the most scenic in the world. It is well worth going out of your way to take a drive up or down the river valley.